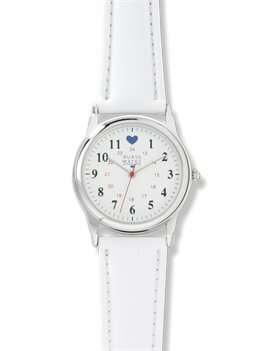 Best selling blue heart watch with 1 1/4" chrome case. Military time and water resistant construction. very nice would tell anyone who know of a nurse to get them one of these. Great watch. I bought this watch as a gift. The only draw back is the band was a bit large. It needs one more hole to fit a petite wrist. Other than that its nice for the price. I like it a lot. The large face is stylish and cute. It’’s a nice product. Thanks. Purchased this for my daughter who is a student Nurse. She’’s not used to wearing a watch but so far so good. I just love it It is so comfortable wearing all day. I bought this nurses watch for my daughter in lawas a christmas gift. i haven’’t given it to her yet. but i’’m sure she will love it. Perfect watch for a nurse or nursing student. Looks great and is offered at a great price. Highly recommended. I wasn’’t happy when I got this item it wasn’’t working and I am hoping it is just the battery. I have to go out and get a new one just to start using it. I hope it works when I replace the battery. Great watch. It is easy to read. The red second hand is easy to follow around the dial. Nice basic watch perfect for a medical professional. I really like this watch but after a few years the leather strap is worn and needs to be replaced. I’’m having a difficult time trying to find a replacement strap. Great watch. Easy to read.